The HBF provides annual support of US$10,000 for the JAPAN PRIZE. “Life” Wins Hoso Bunka Foundation Prize in TV Proposal Division. The winners of the JAPAN PRIZE 2018, an International contest for educational media, were announced and awarded in Tokyo on November 9. In the TV Proposal Division, the Hoso Bunka Foundation Prize for the best proposal was awarded to “Life” by Vientos Culturales A.C., Mexico, selected from the 5 finalists out of 34 entries from 18 countries/regions. 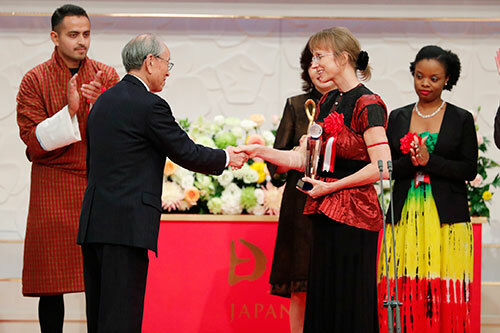 Ms.Elke Franke received the winning trophy from President of the Hoso Bunka Foundation, Dr. Yasuharu Suematsu at the awards ceremony. The TV Proposal Division is intended to support the realization of ideas for educational TV programs in countries/regions with limited budgets and technical facilities. The winner receives a cash prize of US $10,000 and is required to produce and broadcast the proposed program within the year following receipt of the prize.